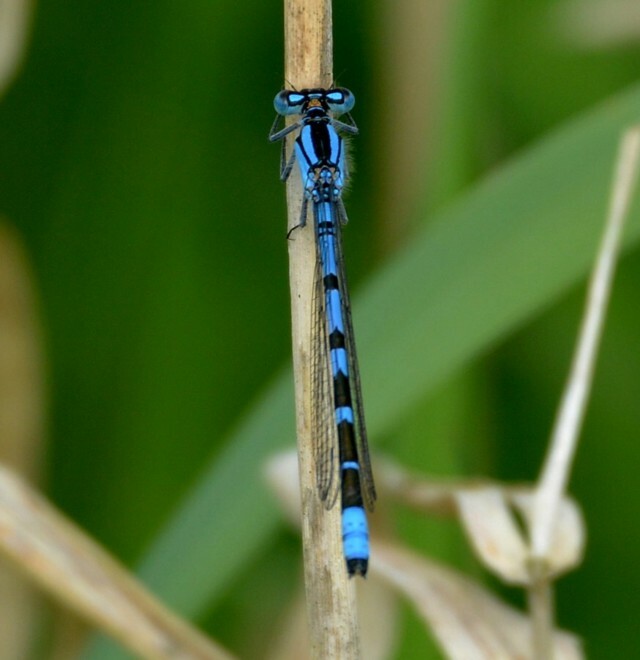 There were 54 species of damselfly and dragonfly on the UK list in 2014 with a split of 21 damselflies and 34 dragonflies. Banded and Beautiful Demoiselle are the only damselfly with coloured wings in the UK. Male Banded Demoiselle have a large dark-blue/black band across the centre of the blue veined wings and a deep blue body colour with metallic green iridescence and similar eye colour. Females have a metallic green body colour, sometimes bronze-green, terminating in a bronze tip. Wings are iridescent pale-amber/green or bronze without the dark centre colour band. Immature males are similar in body colour to mature males but with brownish eyes and the wing band is brown green. Immature females have very pale yellow wings and brown eyes. There were few records of this species until 2006 but are now frequently seen. Banded Demoiselle are less common than the ‘other blue’ damselfly on the Reserve. Active period generally from May through August. Males are predominately blue coloured with blue eyes with thin black rings on the body and have a characteristic ‘U’ shaped black mark on the second segment. Female adults have similar head and thorax markings as males but predominately greenish with thick black separation rings although a pale blue form occurs rather than the vivid blue of the males. They also lack the black ‘U’ shape mark on the second segment. Immatures differ from the adults by both having pale-brown base body colours, more pinkish in the males, with brown eyes which change into the adult colours with maturity. 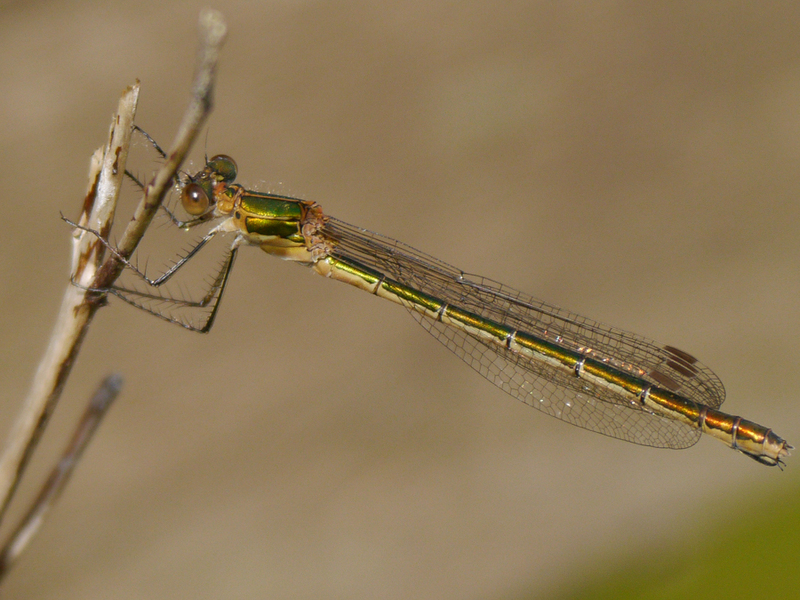 This distinctive damselfly is common throughout the reserve. Active flight period is generally from April through August. Photograph is three images stitched together from left, a mature male on No.3 Bed by David Bowman on 23/05/2015, centre, a mature male and female from No.3 Bed by David Mercer on 11/06/2016 and right, an immature female from No.3 Bed by David Spencer on 19/05/2016. This species has been found to be common on all four beds since recording began in 1986. 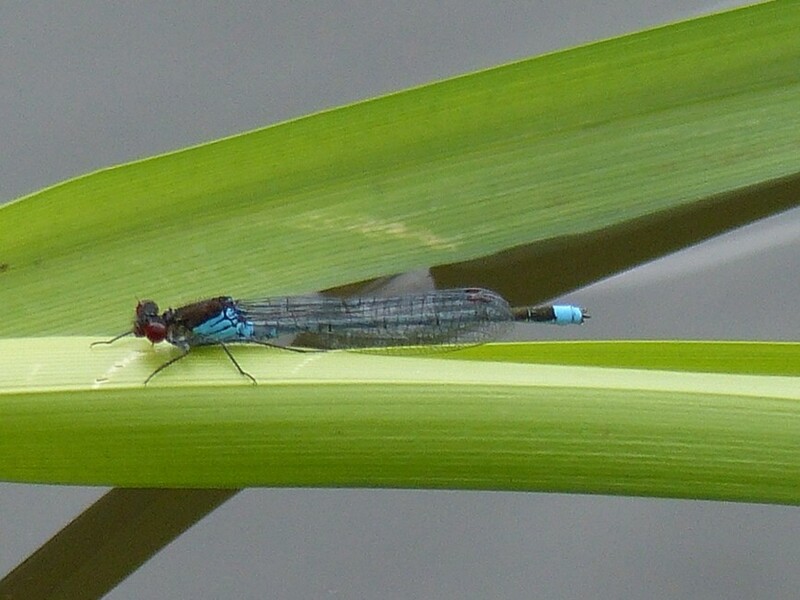 Similar looking to the Azure Damselfly but in general appears to have more blue than black colouration which is reversed in the Azure Damselfly. It also has a wider blue antehumeral stripe on the thorax than the Azure Damselfly and only one black line below this blue antehumeral stripe. Females can be blue coloured as the male or a dull green/grey colour and can be difficult to separate without attention to finer detail. Active period is from April through September. First recorded in 1986 and repeated in 1998 but was probably overlooked until 2006 and is now regularly seen around the Reserve. The male has a dark grey abdomen with a blue tip and deep red eyes. The thorax is bronze/black in both sexes but the female has small yellowish antehumral lines as well. Mature females have dark black-grey abdomens, from top, greenish underneath, with greenish lines separating the segments. All forms and sexes are predominately dark bodied, mature males, always have a bright blue spot at the tail, blue stripes on the thorax and blue eyes. Immature males emerge with greenish stripes on the thorax with gradually change to blue. Females are more variable in colour with mature forms ranging from blue like the males to green thorax + brown tail spot and pale brown thorax + blue tail spot. Immature females can have a violet or pinkish thorax both with blue tail spots. Blue-tailed Damselflies are probably the most common species on the Reserve. Active flight period is generally April through September. 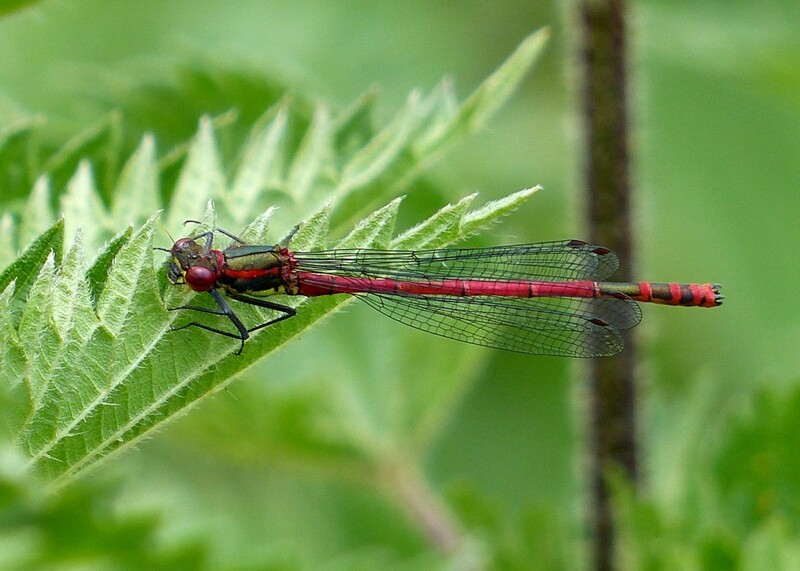 The male is a dark red damselfly with black legs and dark bronze coloured thorax. Females exhibit a variety of colour forms varying in the degree of red and black but all have yellowish rings separating the abdomen segments giving a banded appearance. The species is present on all four beds usually in small numbers. Active period is from April through August. The male of this species is metallic green and develops blue colouration, predominately, in the first and last two segments of the abdomen. The female is thicker bodied and lacks any blue colouration. This species typically holds it wings at in ‘V’ shape when at rest and is relatively common on the reserve since the first record in 1990. Active period is from May to September. Present in small numbers on the Reserve. The male usually shows bright green markings on a dark (black) body and blue spots on the abdomen sides except the last body segments which are coloured blue however specimens with all blue markings can occur. The female is brown with bright green markings. Active period is from April through October. 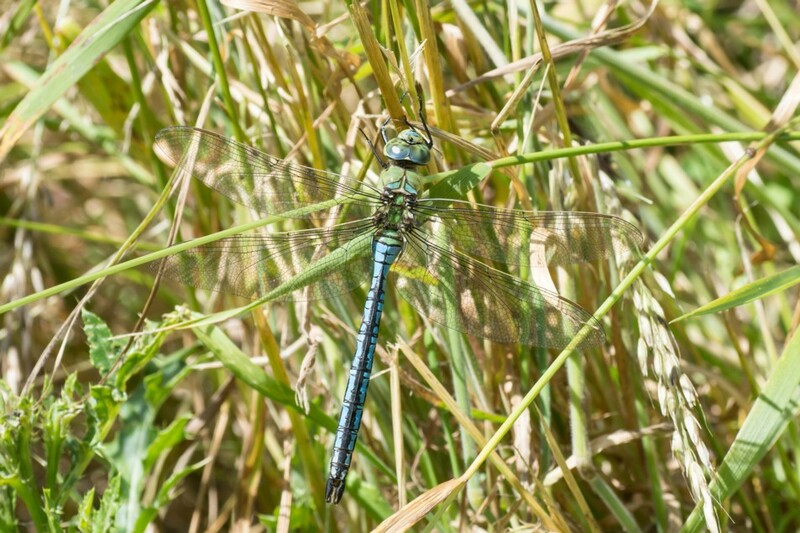 A large dragonfly and historically the most common ‘hawker’ species on the Reserve. 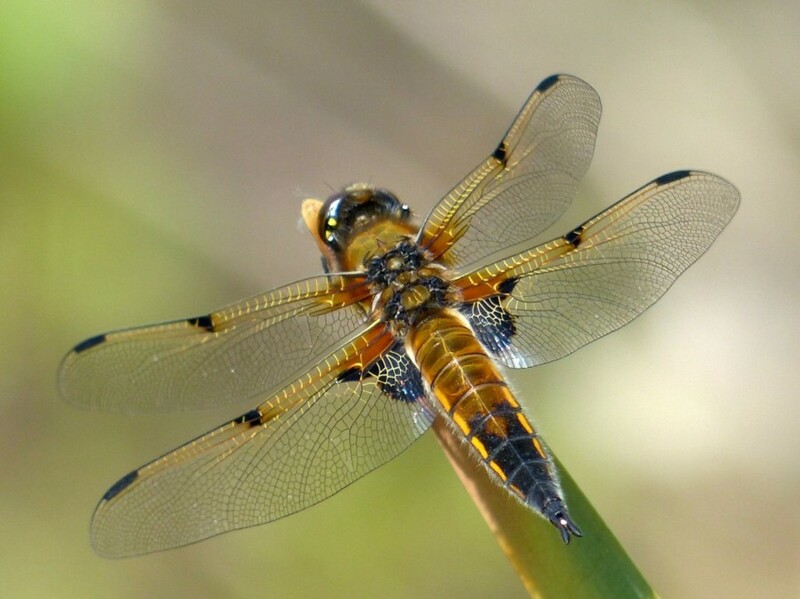 Has obvious golden brown wings and both sexes have strong yellow stripes on the sides of the thorax. The male is chocolate brown with small blue and yellow markings and has a noticeable waisted appearance. The female has small yellow markings and lacks the males waist. Active period from May to October. This Hawker has paired spots along the abdomen, two broad stripes on the sides of the thorax and the leading edge of the wing is yellow in both sexes. 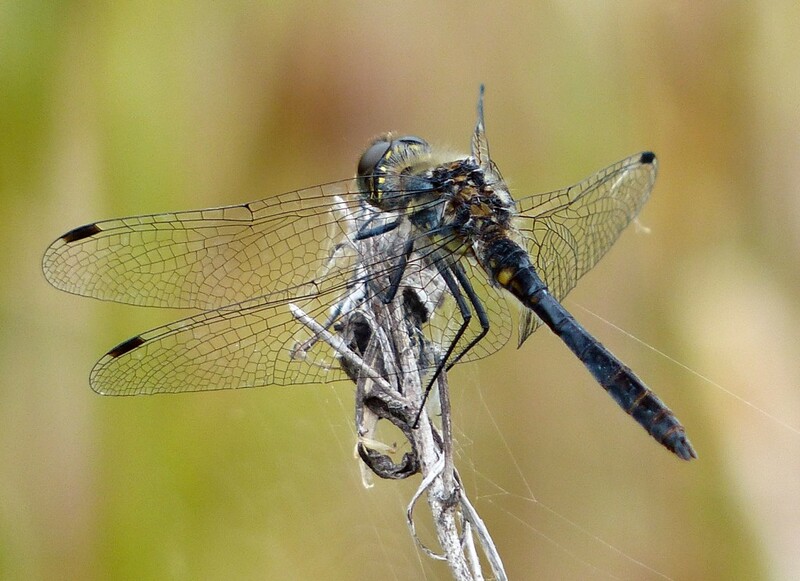 The male has blue spots on each segment of the abdomen and appears quite dark, when in flight, with blue eyes. The female is brown with similar markings to the male but the spots are yellow, or occasionally green or blue and eyes are brownish. Contrary to the name, this species is probably scare and irregularly reported on the Reserve. Active period is from June to October. 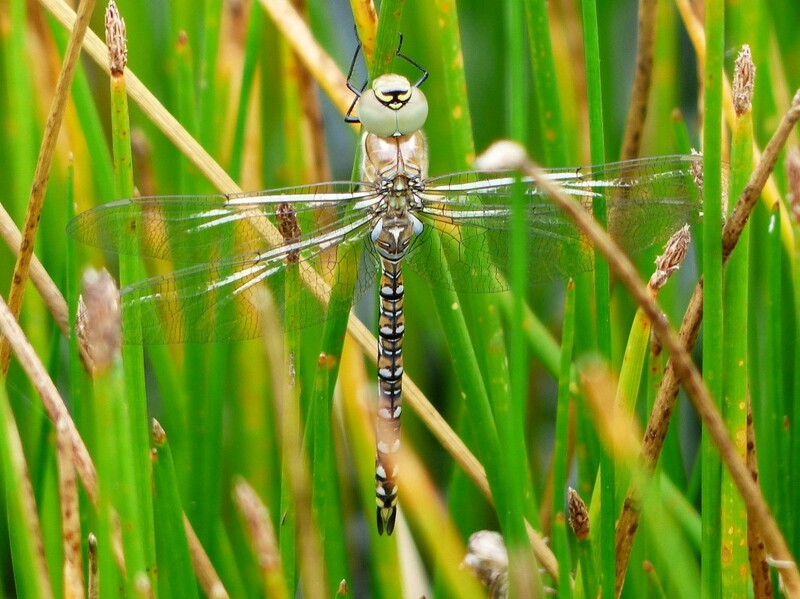 This is one of the latest flying dragonflies and the only Hawker likely to be sighted into November. The male appears dark in flight with paired blue spots along the abdomen and blue eyes. Females are browner with the same paired markings but these are often smaller and yellowish occasionally blue and the eyes are brown. Up close, a small golf-tee shaped diagnostic light mark is clearly visible on the top of the second abdomen segment in both sexes. 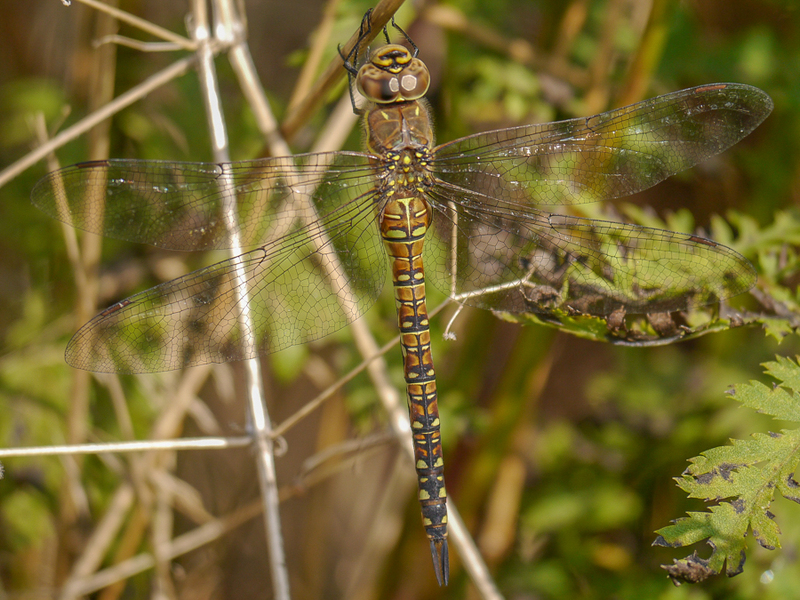 This species, first recorded in 1998 now vies with the Brown Hawker for the most common ‘Hawker’ species on the Reserve. Active period is July through October. A photograph of the female is shown below. A photograph of a female from No4 Bed 04/09/2014. Our largest dragonfly, the male has a bright blue abdomen with a clear black central strip running the full length of the body. The female has a greenish not blue body but similarly marked as the male. Both have a green thorax and green to blue eyes. When first emerged both sexes appear paler green with brown markings before their colours age. First recorded in 2001 has been regularly seen on all water bodies. The irregular records on the Reserve are probably due to under reporting. Flight period is from April to September. Metallic green with a coppery sheen and, as all the ‘emeralds’, noticeable light green eyes. The male is distinguished from the female by a ‘waisted’ abdomen and ‘club’ shaped body. Both sexes have a downy thorax from were the name is derived. A single adult in 1990 is the only Woolston record to date. Principle flight period is from April through July. New to the Reserve list in 2006 is frequently seen today. The male develops a wide blue body with small yellow spots on the segment sides. The female is golden brown on the abdomen with similar yellow spots on the segment sides. 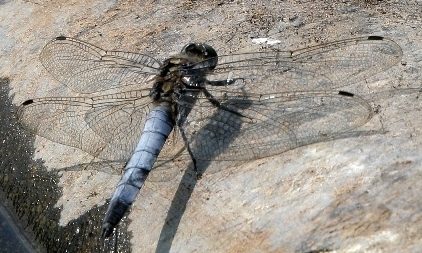 A similar looking species to the Four Spotted Chaser but does not have the mid-wing dark spots but large triangular dark patches at the wing bases. Active period is May through September. Both sexes of this species look alike; brown becoming darker along the abdomen, brown thorax and brown eyes with a row of small yellow spots along the sides of the abodmen. The striking feature however is the dark spots midway along the leading edges of the wings giving the species it’s name. 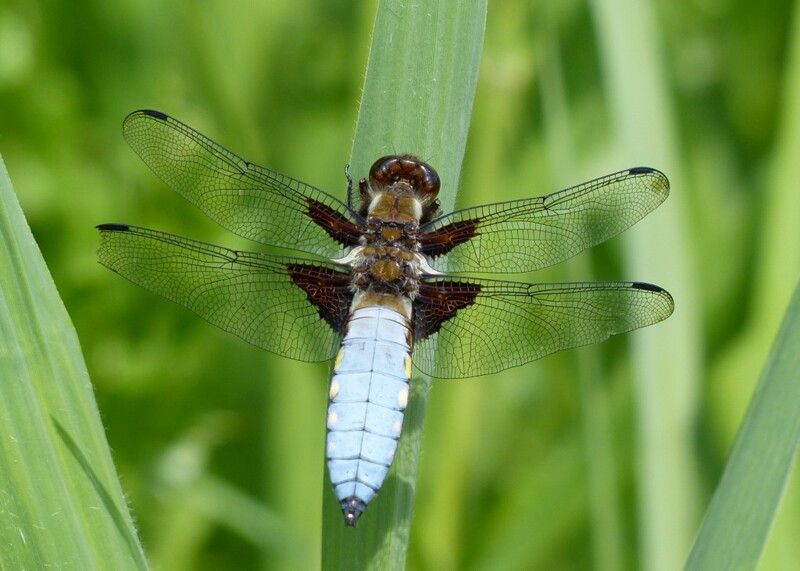 Four-spotted Chasers have been common on the Reserve since the start of records in 1986. Active periods are April through August. Males develop a blue abdomen which darkens to black in the last three segments. Females and immatures are yellowish brown with bold dark lines running down the length of the abdomen and yellowish wings. 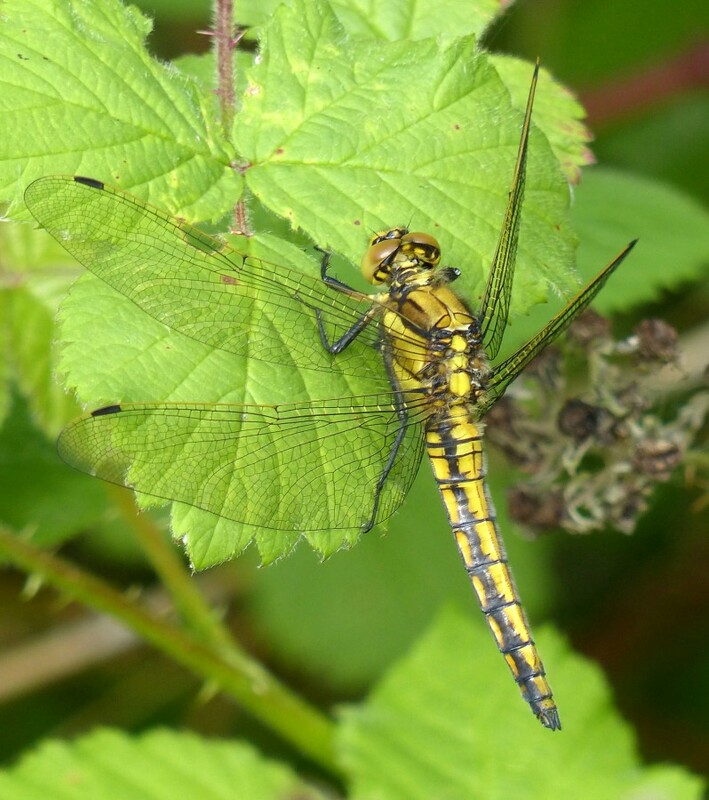 First recorded in 2006 this species is now frequent at the Eyes and should become more so as the dragonfly increases its northern range. Active period is from May through September. 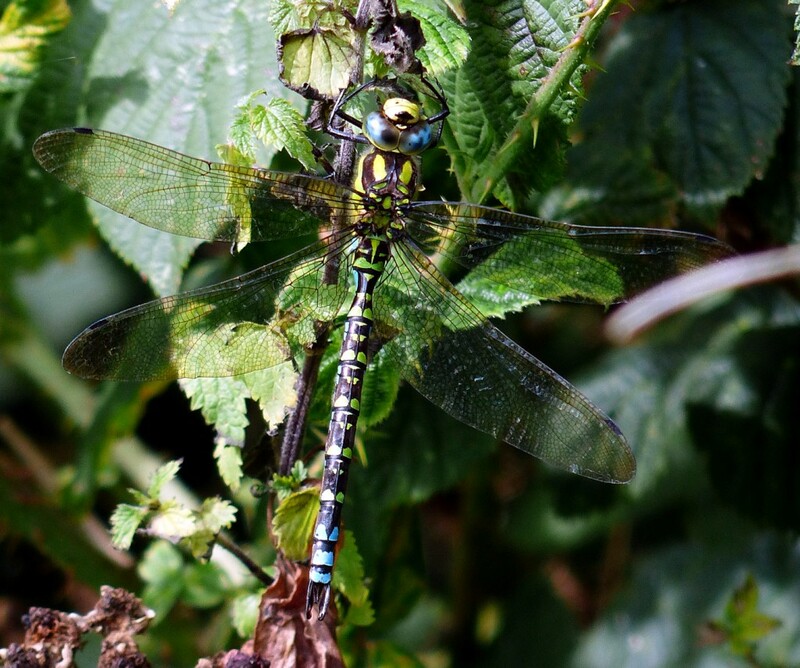 This is a small dragonfly and the male the only ‘black’ - abdomen, thorax and legs - UK dragonfly. Maturity darkens the colouration but yellow markings remain along the abdomen and thorax. Females and immatures have a yellow abdomen and brown thorax with strong black markings on the sides of the thorax and abdomen. This is an uncommon species at Woolston but has been recorded since 1993. Not resident in the UK but is known to migrate here in some years in numbers. Breeding populations occur after these eruptions but fade out after a few years. 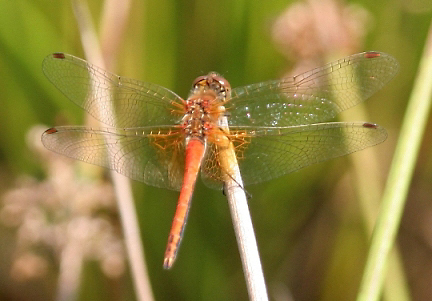 Males become orange red with maturity and red-brown thorax. The females have an ochre yellow abdomen with black marking along the lower sides. The basal areas of the wings especially the inner rear wings are noticeably coloured pale yellow-orange. A continental vagrant, a single male was recorded in 2006 on No1 Bed. Active period for migrants is July through September. A single male was recorded in May 1989 after a large influx into the UK of this continental species. The males are bright red and females yellow-brown. The eyes are brown above and blue-grey below and the bases of the hind wings are yellowish. The pterostigma (dark spot on the leading edge of the wings) is yellow to orange strongly outlined in black. Males become a deep red with maturity with red veins on the wings, particularly on the leading edges, and the thorax are red-brown. Females have a ochre-yellow abdomen with two black lines along each side. The wing veins are yellow at the leading edge and base. Immature males are coloured as the females but have only a single line along each side of the abdomen. A drgonfly of central and southern Europe which in some years migrates north, increasing so since the 1990’s, as far as northern England. The principle flight period is May to November. 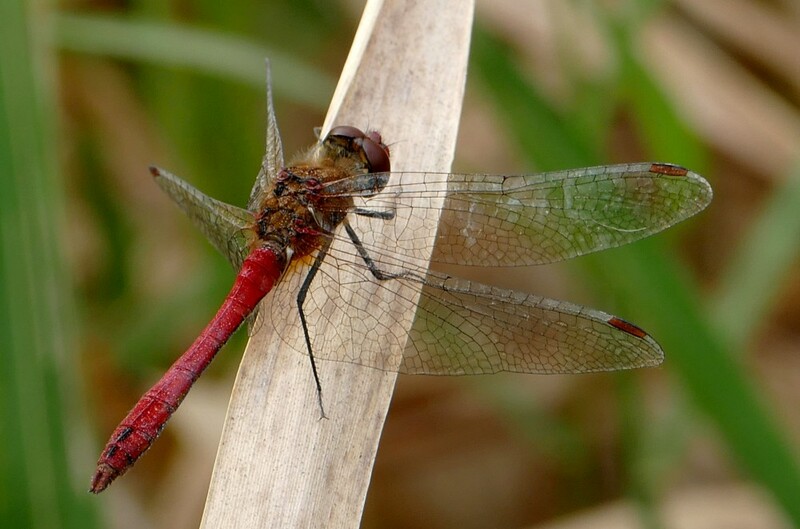 Male abdomens become blood-red (not orange-red as in Common Darter) with maturity with red-brown thorax and they exhibit a very noticeable constriction mid way down the abdomen giving the species a ‘club’ like appearance from above. Females have ochre-yellow abdomen and thorax but can develop with maturity some red along the mid-line and segment boundaries. 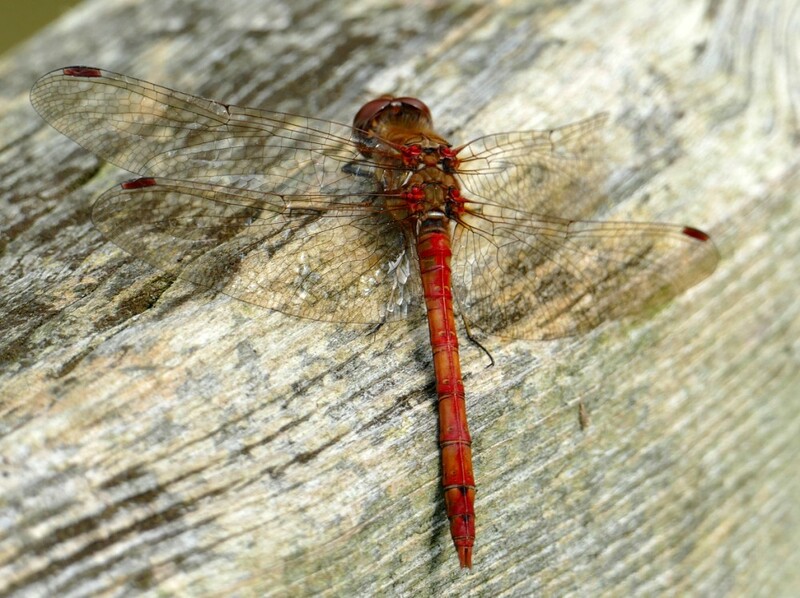 The legs are black without the yellow stripes as in Common Darter (noticeable in the photograph opposite). One of the less common species on the Reserve but as its range increases northwards should produce more records. 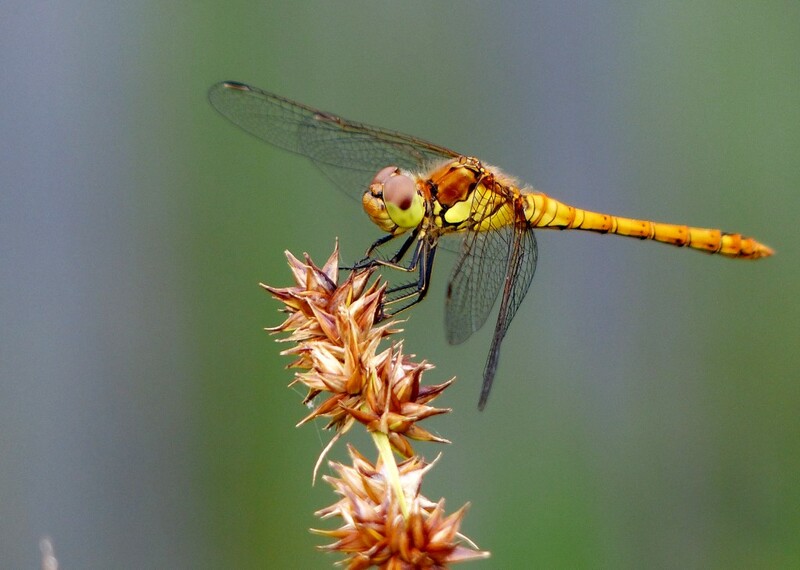 Generally not as early as the Common Darter, emerging in summer and active from July through to November. Males become bright orange-red with maturity with small black spots on the latter segments. Females have a pale, yellowish-brown abdomen often developing red markings along the segment boundaries and mid-line as they mature. 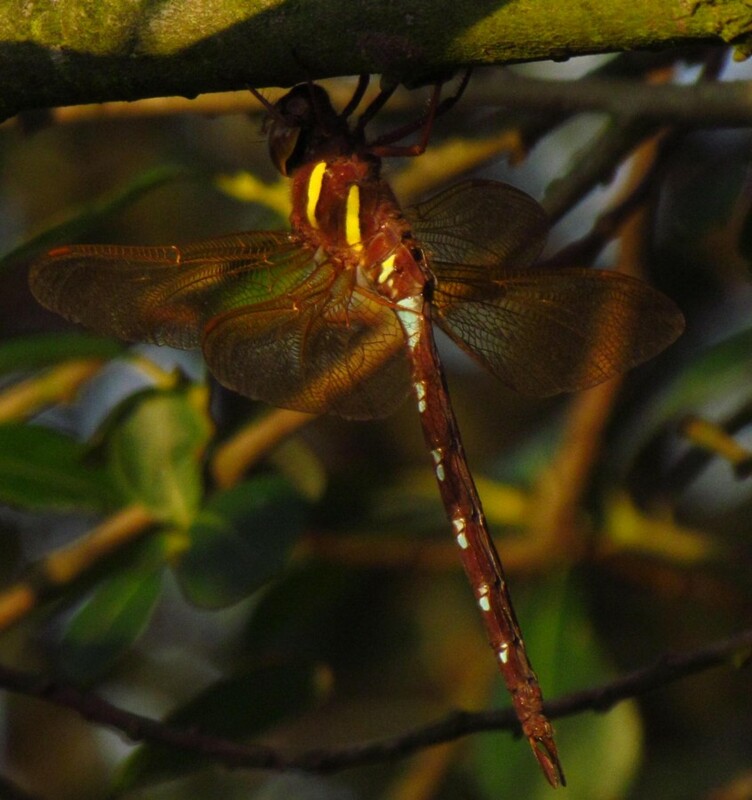 In both sexes the eyes are brown above and yellowish below and the legs black with distinctive yellow lines along their length (both these features are very noticeable on the photo of the female below). Common species on the Reserve, generally active from May through to November.